Regarding Americans with Disabilities Act (ADA) discrepancies, one of the most common discrepancies I find as a compliance inspector is inadequate maneuvering space on the pull side of a pedestrian door. Look at the photo below. On the right side, also referred to as the latch side, there is only about 10 inches before you get to the edge of the walkway. That’s the problem. 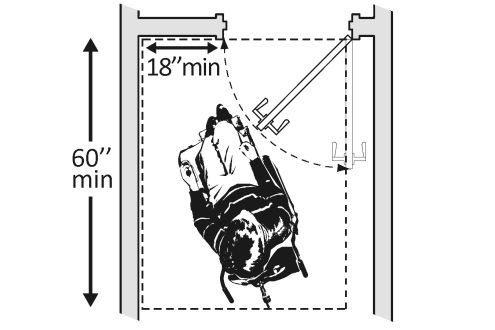 This maneuvering clearance is necesssary so those in a wheelchair can displace beyond the arc of the door swing so they have room to pull the door by their wheelchair. This standard applies to interior and exterior doors. The only exception is for entry doors to hospital patient rooms which are not required to provide the clearance beyond the latch side of the door. So in this installation my recommendation would be to increase the maneuvering space on the walkway at the exterior of the door. Keep in mind that these are minimum maneuvering clearances. In the photo above, on the right side of the walkway is a 6 inch curb dropoff with a vehicular path beyond that. Very dangerous for the handicapped when maneuvering here.